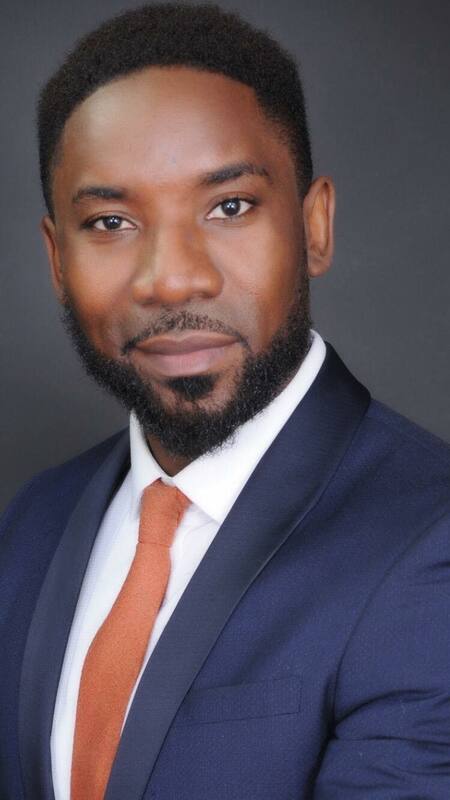 Home Featured Politics ABIA STATE 2019: KOWA Party’s Governorship Candidate In ABIA, “ONYEKACHI BENSON” Reels Out His Developmental Plans For The State, Says “POWER” Is Useless When The People Are not Empowered. 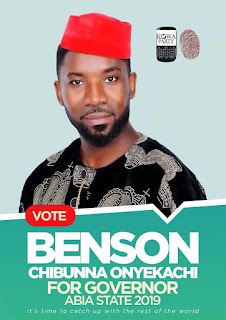 ABIA STATE 2019: KOWA Party’s Governorship Candidate In ABIA, “ONYEKACHI BENSON” Reels Out His Developmental Plans For The State, Says “POWER” Is Useless When The People Are not Empowered. Benson Onyekachi, KOWA Party's Gov'ship candidate in Abia State. The huge desire to change the narratives in the Southeast state of Abia is getting a bit more force than expected, as great individuals are coming out in their droves to help Abians liberate themselves and reclaim the state which had been in the hands of people who not only impoverished her, but had continued to make mess of the state since 1999. From Orji Uzor-Kalu in 1999, to Theodore Orji in 2003 and now Okezie Ikpeazu, the state has witnessed the worst of development amongst other states in the South-East and in the midst of individuals jostling to govern the state today are, Okezie Ikpeazu of the PDP, Uche Oga of the APC, Alex Otti of APGA, others, but one of the new entrants into the race is Onyekachi Benson of the KOWA Party who says he has the Magic Wand to move Abia from being one of the badly developed states, to one others will respect in less than four years of being sworn in as Governor. In this interview, he bore his mind comprehensively on diverse issues on the state and how he intends to develop and move her forward amongst comity of states in Nigeria. 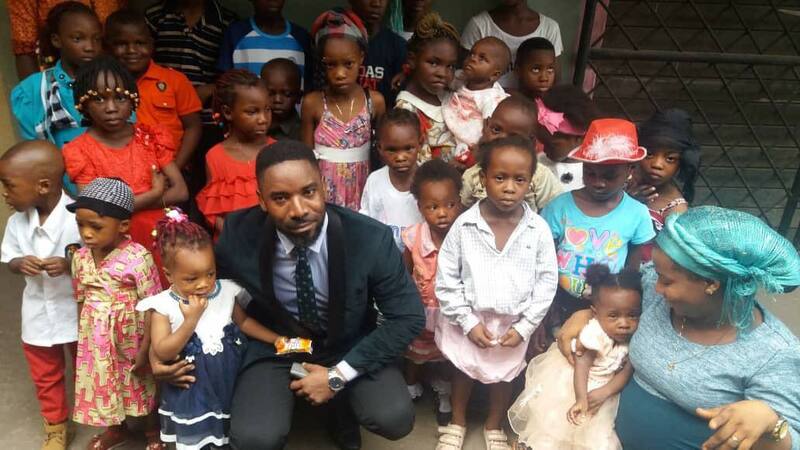 The candidate with Abia children. Q. Many are taken aback that you left your comfort zone in Europe to dabble into the uncertain, murky waters of politics back home. What are the motivating factors? Could it be that you just want to enrich your CV with “a one-time governorship aspirant”? A: I am a very proud son of Abia state but truth be told, it is rather embarrassing the way the state has deteriorated. The entire state looks like we are recovering from a civil war. We are the poorest state in terms of infrastructure. There are no good roads. There are drainage problems everywhere. No portable water. Electricity is scarce. There is high level of unemployment. Pensioners are not being paid. Workers are owed salaries. Our brothers & sisters living with disabilities are totally disconnected from the society. This is despite the vast sums of money available to Abia every month, which includes federal allocation as well as Internally Generated Revenue. It is glaring that there is an alarmingly huge gap between the demand and supply of good governance in Abia state. Abia belongs to all Abians, home and abroad and there’s a saying that “an adult shouldn’t sit by the fireplace and watch his yam get burnt”. Exercises that involve bringing development and pride to our fatherland are everyone’s responsibility. We consult our bests, for example Mikel Obi, Iwobi et al during soccer tournaments to work and bring us glory. It is no difference when it comes to nation building. It was not an easy decision, given my position as a Pharmacist Manager in one of the largest chains in UK and a business owner, but the call to service, to help salvage the soul of Abia made me throw my hat in the ring. Also, my love and devotion goes beyond Abia state and Nigeria. It bothers me that there is not a single successful black country in the world. I feel if we get Nigeria right, the rest of Africa will follow suit. And the question about CV, I don’t think adding one-time governorship aspirant in my CV is relevant in my field of practice. Q. In Nigeria today, the PDP and APC are the two dominant parties and in Abia, the PDP is in power. Followers of Abia politics posit that the governorship contest is a 3-way fight between PDP, APC and APGA. What gives you the conviction that KOWA stands a chance against the three parties? What Abia needs is a candidate that is not tied to the aprons of the past. A candidate that represents the future and understands what governance in the 21stcentury entails. I am that candidate. KOWA party's ideology is primarily social Welfarism and Modernism. Social welfare - the ideology that EVERYONE IS BORN EQUAL and must be treated as such, no one should be accorded special treatment because of their social status, everyone deserves equal access to justice, education and healthcare. Modernism-the philosophy that affirms the power of humans to reshape their environment with the aid of scientific knowledge. KOWA is not an acronym but a word that can mean different things in different Nigerian languages. In Hausa Language, KOWA means 'everybody'; meaning all of us are members. In Yoruba,KOWA means 'let it come'; meaning let the good life come. In Igbo, KOWA means 'explain'(Transparency). KOWA Party believes that a moral obligation is placed on public officers to commit themselves to a lifestyle marked by simplicity unlike the lavish lifestyle we find in other parties. I mean it is sickening to see Leaders living exuberantly while the people they govern can barely afford one decent meal a day. A country which scores abysmally low on almost every single development index must focus on infrastructural development and the provision of long-denied social services. KOWA party believes that Nigerian youths play a huge role in the all-round development of Nigeria so we welcome youths with our arms wide open. Q. KOWA party is open to people of all ages and tribe. What do you make of the Abia rotational governorship formula which its proponents call ‘Abia Charter of equity’? You are from Ikwuano LG which is within the Umuahia axis, the same area that produced the immediate past governor, Senator Theodore Orji. Are you not worried that your governorship ambition runs counter to this Charter? I am worried that children are going to bed hungry. I am worried that our sisters die from complications of childbirth due to decayed facilities and poorly trained staffs. I am worried that the teeming unemployed graduates and youth are roaming the streets unsure of the future. I am worried that our mothers can’t afford to change their wrappers. A couple of weeks ago, one of my campaign personnel’s mother was given a not so befitting burial because her father had not been paid a pension from last August. People can barely afford the basic necessities of human existence – food, clothes, shelter. Don’t get me wrong, the Charter of equity agreement is great but the welfare of the entirety of the people comes first. As a pharmacist, there are strict treatment protocols and guidelines we follow when drawing up pharmaceutical care plans, however that is what we call using your professional judgement. Also, naturally there is common sense as well. If a government is not taking care of its people, hunger and poverty knows no equity. Q. Having lived in Britain for a long time, your opponents say you are not in tune with Abia nor in touch with its politics, its problems and its peculiarities. They say you are actually a pretender and not a contender and you are in the governorship race to negotiate a political appointment with the eventual winner of the March 9 election. How do you react to this? No one can say I am not in tune with Abia. Abia’s problems affect everyone. Those in the Diaspora have families living in Nigeria. Monies are remitted monthly for them to solve the problems that the government should ideally be solving. While Bank managers make huge profits from peoples’ monies and the government do not make credits available to individuals to start up businesses, we in the Diaspora send huge amounts of money to loved ones to begin businesses or buy education or provide shelter and security. For the political space, you can see that I haven’t really missed much owing to the lack of impact on the lives of Abians by the politicians. May I say that I am not your typical politician, I am a change advocate. If I wanted to build a career in politics, I would do so locally in my local community in Croydon, Britain. I want a change in Abia. An Abia where everyone would be a productive entity, especially those at the primes of their lives. I commit to be part of that change. Q. You are a young man vying for the office of governor, in terms of performance, how would you rate young people who have held political offices in the past and those presently holding them? Baba na the same people dey hold am since 1strepublic. The political space is made up of gerontocrats who have concentrated powers in their hands, those who are getting closer to retiring are building political dynasties and stage-managing transfer of powers to sons, sons-in-law and the rest. Q. Godfatherism has come to be embedded in Nigeria’s body politics and Abia has always been in the news as one of the states parading avalanche of godfathers who pulls the strings to determine who goes where. In this race, who is your godfather? I do not have a godfather. The drawback to Abia’s development is godfatherism. If a godfather sponsors your election and buys a position for you, you would have to remit resources to them. I think Abia practice a primitive form of democracy. Maybe I could say that politics has been turned into a business venture so that native ways of transacting businesses have been incorporated into politics. You know in Igbo businesses; you serve under a master, then the master finances and establishes you. Godfathers have access to the coffers of the state, so they finance any candidate who promises to give them continuing access to the coffers. The people are poor and hungry, they leverage on this. They oppress the people, fund violence to instil fear in people, emphasize money politics and bankroll incompetent candidates. I do not need a godfather, I have self-funded to the best of my ability and some help from crowd-funding. At the end, I will be accountable to the good people of Abia and not to a godfather. Q. Generality of Abians rue that Umuahia lacks the trappings of a modern state capital when compared to capitals of neighbouring states. What are your plans for Umuahia if elected? We would build a state of the art, tourist-attractive capital city. We will construct, reconstruct, beautify and electrify all the entrant roads to the capital. Umudike road, Ubakala road, Uzuakoli road, Amakama. We would replace the Abia tower with a modern day 21st century tower, making it tourist attractive, with roof gardens and recreational areas at the top. We would employ the best of hands, developers, town planners and horticulturists. Q. As someone who lives and operates businesses in Europe, what are the unique businesses and political experiences you are bringing into the governance of Abia? We would focus on our strengths which are Agriculture and Education. We will industrialize these two key sectors. We will grow our IGR by making education an industry. You find that Nigeria export huge capitals in billions of dollars to buy education. For instance, 70000 Nigerian students spend over $1B per annum schooling in Ghana. As a result, we also lose human capital to Ghana and other countries; UK is also a classic example of where institutions are funded by tuition fees from foreign students, Nigerians making up a large proportion. We would revamp our school and universities infrastructure, laboratories and build new schools to world class standards. We will train and retrain our teachers. We will make teaching attractive by taking teachers off tax, so that our teeming unemployed can get jobs, that way we would get enough manpower for the influx of education tourists. We will invest in our School of Agriculture and research institutes. We will industrialize agriculture in such a way that we would identify advantage crops in each local governments and plant agro-allied industries focusing on these crops. We will build export centres. We will also expand on animal husbandry. We will harness on digital advantage. Other areas we will revolutionise will be in sports and entertainment, we will privatize Enyimba FC , so that the new owners will thrive to give it global visibility. We will also generate revenues from constant match fixtures and souvenir sales. Enyimba FC Jerseys will be obtainable in the streets of the world. We will also expand the stadium to accommodate concerts so that we can generate revenues from Nigeria’s flourishing export-Music. Business cannot flourish without access to credits. We will ensure policies that will enable small and medium sized businesses get loans. We will also ensure that interest rates are minimal. The beauty of Nigeria is that there are so many things that have not been done, so that gives opportunities for entrepreneurship. Politically, the first thing we would do when we resume office will be to conduct a census of population total of Abians and categorise into age, gender, location, household income etc. This is very important for investors to decipher where to build factories, stores or offices, this will ensure accessible employment. Developers will need this to determine where to build new houses and where to revamp. Security agencies would need this for policing, emergency preparedness for example during disasters. Q. Why should Abians vote you? And what will you do differently from the incumbent governor, Okezie Ikpeazu? I represent what a 21st century leader should be; young, compassionate, innovative and enterprising.I will be transparent and accountable. We have published a 100-page document on how we will inform our people of all allocation accrued to them and how they will be disbursed every step of the way. I will carry my people along. That way, confidence will be restored to democracy.I also would propose to cut down on the remunerations politicians get. It is absurd how much each politician earns. They earn in two months or less what the prime minister of the UK earns. It is not right, especially when ordinary people are living below the acceptable standard. Q. What informed your choice of KOWA as a platform to realize your governorship ambition? What makes KOWA thick? KOWA’s ideology as mentioned earlier informed my judgment. They are based on these two: Welfarism & Modernism. Welfarism simply put, utilising our commonwealth to take care of all and sundry, not just a few, especially those that are unable to take care of themselves- persons with disabilities, elderly, homeless, widows, orphans. Modernism is self-explanatory. The constant use of science and technology to effect changes in our ever-evolving world. People opine that KOWA party lack the structure to win. KOWA actually does have representatives in all 17 LGAs in Abia. You see because of the type of politics practiced in Nigeria, what people refer to as structure, in my mental reckoning is having vote buyers scattered around the state to bribe their way into position. We will never achieve true democracy if parties keep doing this. There are dozens of other candidates, what stands you out? I am young; I speak the young people’s language. I represent the future. The other candidates are tied to the aprons of the past. They have cross carpeted from one party to another, they are the same recycled candidates. I am a skilled professional as a pharmacist, so my skills will come in handy in our quest to revolutionise the healthcare system. I do not have Godfathers to remit public funds to. I have travelled wide and I understand what it takes to build a decent society. I also do not have to spend tax payer’s money travelling the world looking for investors; I already have them as contacts, colleagues and associates. So you see, I am ready to hit the ground running. Juxtaposing the British and Nigerian political environments, including electioneering campaigns, what is your impression of politics in Nigeria and what has been your experience thus far? Nigeria is not as democratic as it should be. We have carry-overs of elements of military regime. Executive leaders concentrate power in their hands and subordinate other arms of government. Outdated practices are infused into politics. The rights of people are regularly violated. There is zero regard to the rules of law, due processes and procedures. Accountability, the very nature of democracy is non-existent. Poverty and hunger is the weapon politicians use, rather than intellectual capacity during electioneering process. The people, on the other hand, are not educated on the essence of election. Most people, especially those at the grassroots, religiously vote every four years, not because they want change, but because this is the only period, they can afford decent meals and other freebies by selling their votes. The politicians leverage on this. While British politicians see opposition parties as people with alternative views, Nigerians see oppositions as enemies. There is also that spiritual interpretation of power by followers of leaders “the chosen one” or “God sent” wherein visions and power is not to be constrained or challenged by any individual or body. Nigerians, especially the youth, should be sensitized to understand that it is their constitutional right to aspire to lead, to stand for positions. I am glad that awareness is being raised and public figures, like Banky W, are taking the bulls by the horns. There are gross electoral misconducts in Nigeria, parties openly buy votes and also intimidate voters. There are huge monetary inducements during elections. There may never be a free and fair election until poverty is wiped out. Again, the people need to understand the power they have in their votes and that they can sacrifice taking bribes and vote right. Only then can true change come.